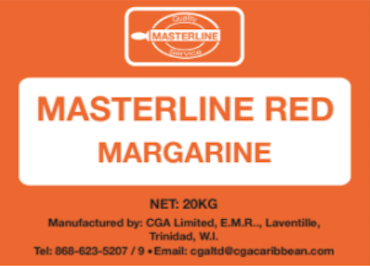 We produce Industrial Margarines for many large bakeries across Trinidad and Tobago inclusive of the Masterline range, acquired from Unilever in 2004. We manufacture products for industrial customers like PriceSmart, McDonald’s, Burger King, Royal Castle, Popeye’s and others. We also do contract manufacturing for both small companies and larger companies such as Grace Kennedy Ltd., True and Natural Ltd. and major clients in the past such as Unilever, Colgate and Johnson and Johnson’s. An all-vegetable pastry margarine that affords easy lamination, does not need refrigeration, and provides an excellent, mild-buttery flavour. INGREDIENTS: Vegetable Fats, Refined Vegetable Oil, Water, Salt, Citric Acid, Potassium Sorbate, Butter Flavour, Beta-Carotene. 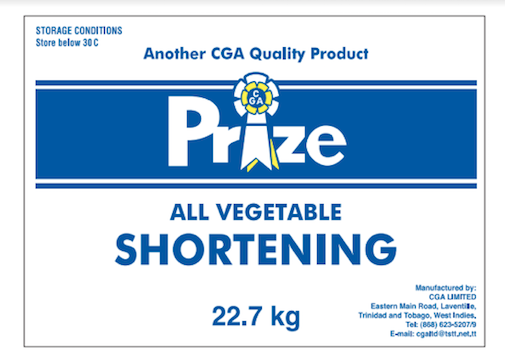 This is an ideal, all vegetable margarine for cakes, frosting, choux pastry and ice cream. It provides good creaming ability, supports the addition of extra liquids, and extends the shelf life of baked goods. It also supports good overrun properties in ice cream mixes, has no cholesterol and has a mild buttery flavour. Extended storage: 5 - 15 °C. Keep at temperatures below 20 - 30 °C for bakery application. This all-vegetable liquid shortening is a favourite of Subway franchises who use it for bread and any yeast-raised-dough because it improves visco-elasticity of wheat gluten. This provides improved dough tolerance, finer crumb texture and increased volume in yeast raised baked goods. Keep at ambient temperatures approximately 25-30 °C. N.B. If stored at temperatures below 20 °C product will congeal. This all vegetable margarine is easy-to-use, improves dough handling and bread volume, and keeps bread fresh for longer. It has a neutral colour that makes it ideal for white cakes and toppings. Volumax can also be substituted for high calorie shortenings and is formulated for improved taste, texture and creaming properties. Vegetable Fat and Oil, Water, Salt, Soya Lecithin, Emulsifier, Potassium Sorbate, Citric Acid. Extended storage: 5 - 15 °C. Keep at temperatures 20 - 30 °C for bakery application. This shortening is great for both white and whole wheat breads, pastries, cakes, toppings and confectionary application. Extended storage. Keep between 20 - 30 °C for bakery application. 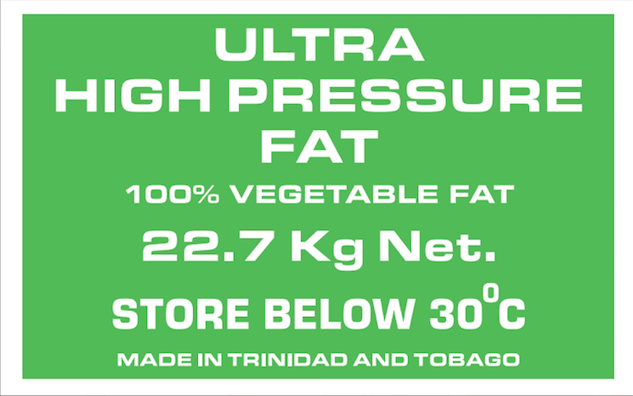 This all-vegetable frying fat is specially designed for the deep fat frying of chicken, meats, seafood, potatoes, snack foods and donuts. It can withstand frying temperatures for longer periods than oils, provides greater yields, improves the flavour of fried foods and does not smoke at normal frying temperatures. It has 0% trans fat, no cholesterol and a shelf life of nine months. 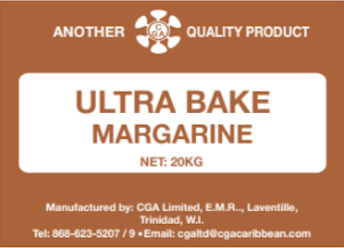 Trans Free Fat Cooking and Baking Margarine with authentic Caribbean Flavour. Vegetable Fats & Oils, Water, Salt, Soy Lecithin, Emulsifier, Antioxidant, Preservative, Butter Flavours, Beta-Carotene, Apocarotenal, Annatto. STORAGE: Ideal storage 5 -15 °C but can be kept below 30 °C for short term storage. Can be substituted for high calorie shortenings, formulated for improved taste and creaming properties. Neutral colour ideal for white cakes and toppings. 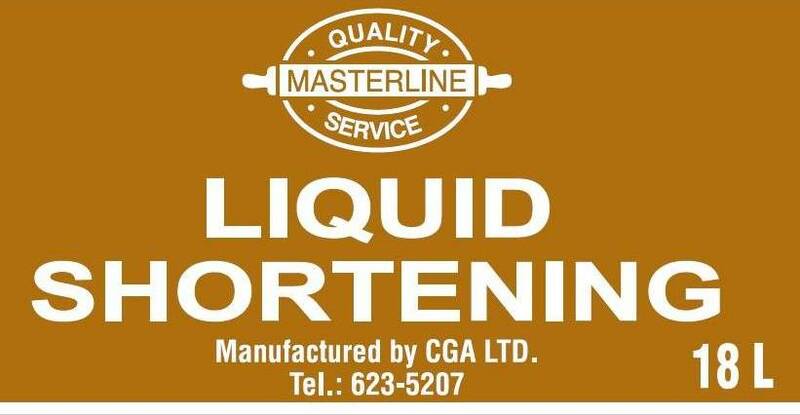 Vegetable Oils, Water, Salt, Emulsifier, Soya Lecithin, Preservative, Citric Acid. Ideal storage 5- 15 °C. Keep at temperatures 20 - 30 °C for bakery application. 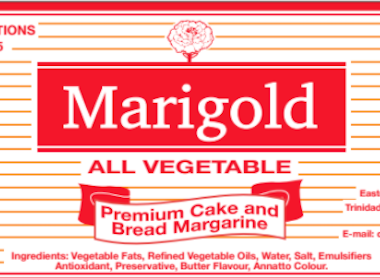 Marigold margarine is perfect on breads and in sandwiches, is great for cake making and a dependable ingredient for pastry dough, breads and various dishes. With its no cholesterol and added Beta Carotene, Marigold is a healthy replacement for butter. Ideal storage 5 -15 °C for maximum shelf life. May be kept below 30 °C for short term storage. 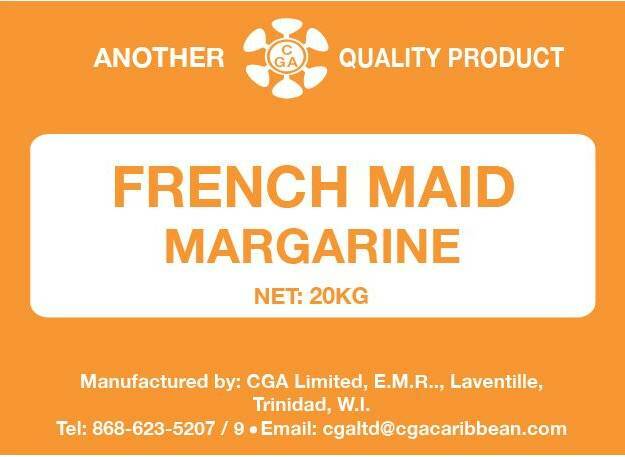 Ideal for cooking and baking, has a rich vibrant colour with authentic Caribbean Flavour and is trans fat free. Its rich butter flavour enhances aroma and taste of foods. An all vegetable shortening ideal for both white and whole wheat brads, pastries, cakes, toppings and confectionery applications, easy pan release applications. Trans Free Vegetable Fat and Oil. Ideal storage: Below 30 °C for short term storage. Designed by CGA Limited for fast-food application, Special Frying Oil is a unique blend of oils that provide the major attributes of a fine frying oil. 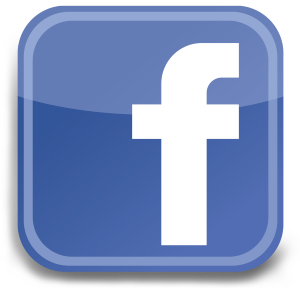 Vegetable Oils, Polydimethylsiloxane (antifoaming agent) and TBHQ (antioxidant). 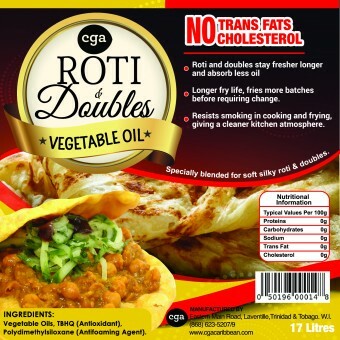 A special blend of oils designed for roti and doubles to stay fresher longer and absorb less oil. It has a longer fry life and resists smoking in cooking and frying to give a cleaner kitchen atmosphere. It has zero trans fats and no cholesterol. INGREDIENTS: Vegetable Oils, Polydimethylsiloxane (antifoaming agent) and TBHQ (antioxidant).